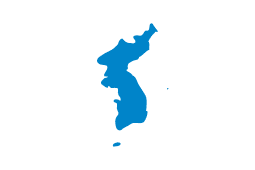 North and South Korea, while competing separately, will march under the joint "Unification Flag" at the upcoming Pyeongchang Olympics next month. "The flag was first used in 1991 when the two countries competed as a single team in the 41st World Table Tennis Championships in Chiba, Japan and the 8th World Youth Football Championship in Lisbon, Portugal. The two countries' teams marched together under the flag in the opening ceremonies of the 2000 Summer Olympics in Sydney, Australia; the 2002 Asian Games in Busan, South Korea; the 2003 Summer Universiade in Daegu, South Korea; the 2004 Summer Olympics in Athens, Greece; the 2006 Winter Olympics in Turin, Italy; and the 2006 Asian Games in Doha, Qatar; however, the two countries competed separately in sporting events. The flag was not used in the 2008 Summer Olympics in Beijing, China. Not only was a unified team shelved, even Beijing Olympics Organization Committee (BOCOG)'s plan to make the two Korean teams turn up back to back during the opening ceremony was rejected due to opposition by the North Korean delegation at the last moment." By my "stable genius" math skills, this will be the eighth time it's been used officially. Flag-wise, I love the colors but am kind of put off by how damn literal the thing is. It's downright Rorschachian.